IF WE CAN'T LEARN FROM OUR POLITICAL LEADERS' MISTAKES, then what good are they? 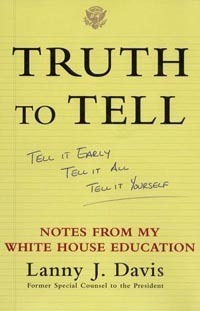 Lanny Davis wrote a book about his experience as the guy who tried to deal with all of President Clinton's crises, and the subtitle of the book was "Tell It Early; Tell It All; Tell It Yourself." That's a compact summary of how we in the p.r. business and our clients should approach crisis communications. That's the mantra he seems to repeat whenever a scandal erupts, and it's likely what he tells his clients as a crisis communications counselor at a D.C. law firm. Once again, in an interview this morning on NPR's Morning Edition (listen to it by clicking here), Davis opined that Republican leaders in the House will pay dearly for violating his mantra. "If Mr. [Speaker of the House Dennis] Hastert had asked my advice as a professional crisis manager, I would have given him that advice," Davis told NPR's Steve Inskeep. "It's amazing how many people in this situation forget the basic lessons of what I just said." Once someone has already violated the basic rules, what then? "Exactly the opposite of what Mr. Hastert is doing," said Davis. "instead of going on Rush Limbaugh and trying to change the subject or trying to defend and being in a crouch and defensive position, you step up to the line, you say, 'I made a misjudgement. We should have done it differently. We're going to investigate this, and I am sorry.' If he had made any of those statements, this story would have no legs. The only thing feeding this story is: first deny, then change the subject and then attack, which is what, I have to say, it's not just Mr. Hastert. Most politicians in this situation, Democrat or Republican, do exactly the wrong thing. From Richard Nixon all the way to all of the scandals. They somehow forget history and then go into a crouch, deny, let the story dribble out, give it legs over time, instead of cutting it off, taking responsibility, and moving on." Davis said that this was not a partisan shot and that his fellow Democrats should be careful not to take advantage of the Republicans at this moment of vulnerability. "I do not speak as a partisan Democrat. In fact, I would urge my fellow Democrats to resist the tempation -- I know it's tough -- and not exploit the situation," he said. Basically, he's right about shining a light on your problems, as I think Tip O'Neill once put it. But I also understand why politicians are so reluctant. They will be savaged by a press that is so hungry for content. This morning I watched CNN's morning program, and it seemed like they could not wait more than about five minutes before they had to get back to the Foley story, even though the storyline didn't move an inch in the interim. Shining a light on your problems, it seems, just gives them more fodder, and it takes real guts. But Davis is right; it has to be done. Those are the laws of crisis communications.